Ohm’s law is the fundamental law in the field of electricity. It was discovered by George Ohm, and named after him. Ohm’s law provides the relationship between current, voltage, and resistance. It states that, the voltage across any resistance is equal to current times the resistance. You can also find the current and resistance from the ohm’s law. If you want to easily remember the ohm’s law without confusing between the formulas. Try the triangle given below. In this triangle, all the three quantities are given. Follow the steps below to find the voltage, current, and resistance. To find the voltage, just place the hand on V. You will see that, ‘I’ and ‘R’ are in multiplication form, just multiply them and get the voltage. 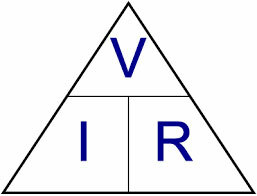 To find the current, place the hand on ‘I’ and you will see that, ‘V’ and ‘R’ are in division form. Just divide the V by R to get the current. To find the resistance, place you hand on ‘R’, and you will see that, ‘V’ and ‘I’ are in division form. Divide the V by I to get the resistance. Solve the following problems to get a grip on the ohm’s law. Problem 1: The current through a resistor is measured to be 5 amperes. The resistance of the resistor is 10 ohms. What is the voltage across the resistor? Problem 2: Voltage across a resistor was found to be 12 volts, and the current through it was 0.5 amperes. What is the resistance of the resistor? Problem 3: Voltage across a resistor was measured to be 50 volts. The value of the resistor is 100 ohms. What is the current through it? Voltmeter is used to measure the voltage across any component in a circuit. Ammeter is used to measure the current in a circuit. Multimeter is device used to measure voltage, current, and resistance. Some multimeters can also measure temperature. Abdul Wahab, "Ohm’s Law," in Science4Fun, April 13, 2019, http://science4fun.info/ohms-law/.